Celia Frost is a freak. At least that's what everyone thinks. Her life is ruled by a rare disorder that means she could bleed to death from the slightest cut, confining her to a gloomy bubble of safetyA". No friends. No fun. No life. But when a knife attack on Celia has unexpected consequences, her mum reacts strangely. Suddenly they're on the run. Why is her mum so scared? Someone out there knows - and when they find Celia, she's going to wish the truth was a lie - A buried secret; a gripping manhunt; a dangerous deceit: what is the truth about Celia Frost? A page-turning thriller that's impossible to put down. 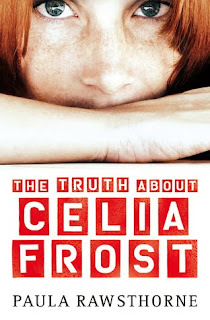 I found the Truth About Celia Frost by Paula Rawsthorne to be a very interesting story. Aimed at a younger audience than what I'd normally read, but still absolutely gripping and addictive reading that will make you think. Celia Frost is a 14 year old girl with an unusual problem - she has a rare blood condition that means that she could possibly die from any small cut. Living alone with her mom, it has been drummed into Celia for as long as she can remember that Celia is different to other kids her own age. She must be careful and not take risks. She can't put herself into any situation that might cause her to bleed. So for Celia, life is pretty unbearable. She's bullied and teased at school, she's isolated from schoolmates and singled out in front of the school. Her mother moves her around a lot and she has no stable place to call home. I felt very sad for Celia right from the beginning, it doesn't seem like the type of life that a teenage girl should be living. When a particularly mean bully at school attacks Celia and she is carted off to the emergency room, things don't go quite as Celia expects. She doesn't die and the doctor can find nothing wrong with the way her blood stops on its own. When Celia's mother starts to panic and they immediately leave town, Celia begins to question everything her mother has ever told her. Has her entire life been a lie? Or has Celia's mother been hiding a more serious secret? The Truth About Celia Frost is told from two main perspectives, Celia's as well as a dodgy private investigator who is hired from an unknown source to track down the Frosts. It's an interesting dual-narrative and I think it really adds to the mystery trying to be solved here - who is tracking down Celia, and what's the deal with her blood? Though there isn't a great deal of plot in this book, it is really nice to see Celia transform from a kicked-dog teenager into a young woman with more confidence and strength to her as she sticks up for herself and becomes more independent. Even making a really great friend in one of the neighbour boys, Sol. I think The Truth About Celia Frost brings up some interesting themes - that of letting children become their own people and giving them some independence and to trust that they will be OK. It made me think of Celia's quality of life - where is that right balance between living your life freely and being alive but without any pleasure of happiness. Though I did feel like the whingey/manipulative relationship between Celia and her mother wasn't particularly believeable, I did find the friendship between Celia and Sol to be heart-warming and incredibly sweet. Celia Frost as a main character really pulled at my heartstrings and right from the start, I was emotionally invested in her and was really rooting for her to end up in a good place. Once started, I really couldn't put this book down. Highly recommended. Great review, sounds like the concept behind the story is pretty strong. This sounds amazing. Great review! Jenni - It's definitely an interesting concept, and I do so love reading a book that is very different to anything else I've read before. Zoe - It is really good!